Let’s see how this all went down. 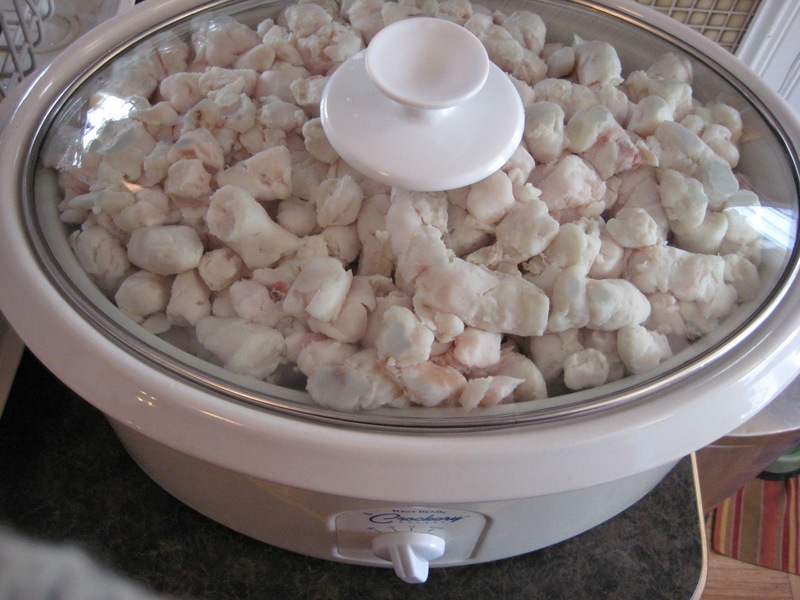 I used the crockpot method, as outlined in the wonderful Simple Green Frugal blog. The fat came from my brother-in-law, who buys whole butchered pigs from a farmer in NW Minnesota. I think he throws the fat in for free. It sat in his freezer for a few months, then in mine for several weeks. We thawed it completely before starting. HOLY COW was that a big bag. I had to go through the whole process twice. 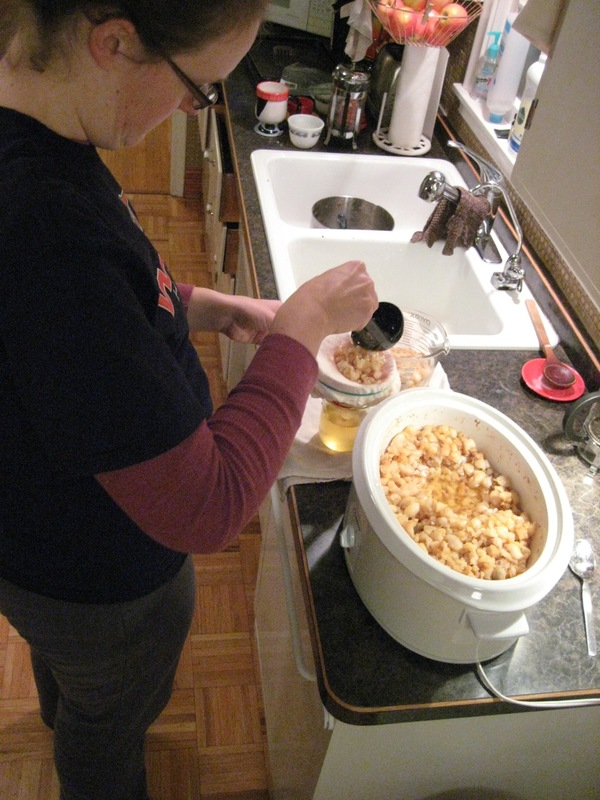 Here I am ladling the melted fat and cracklings into my cheesecloth-covered canning funnel. I froze all the leftover cracklings and have no clue what to do with them. They smelled so disgusting I couldn’t bring myself to try one. Lard chilling out in the snow on the deck. And the final product. As you can see, it is not the pure white I was expecting. The “porky” taste is also much stronger than I anticipated. With my first batch, I thought it was because I didn’t cook it long enough, so I let the second batch cook longer, but with the same result. I’m confused, because the lard we bought from the co-op was pure white, only smelled slightly porky, and gave no porky flavor to anything we baked with it. I’m going to venture a guess here: it’s possible that the stuff from the co-op, which was a little on the expensive side, was pure leaf lard, whereas the fat I used was maybe fatback or caul fat. The only reason I guess that is because of the sheer amount of fat that was in the bag. It was over ten pounds. So, readers, do you think that’s it? It’s not like the lard is unuseable, it’s just that you have to, uh, develop a taste for it I guess? 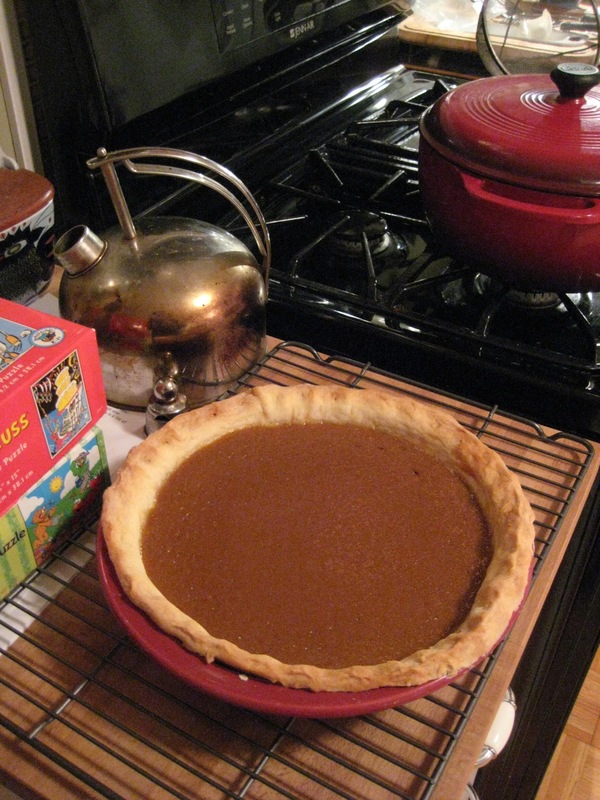 The kids sure didn’t seem to notice the ever-so-slight pork flavor in the crust of this otherwise-delicious pumpkin pie. I think it’s me. I have an oversensitive palate for this sort of thing. Perhaps because I was raised on margarine. 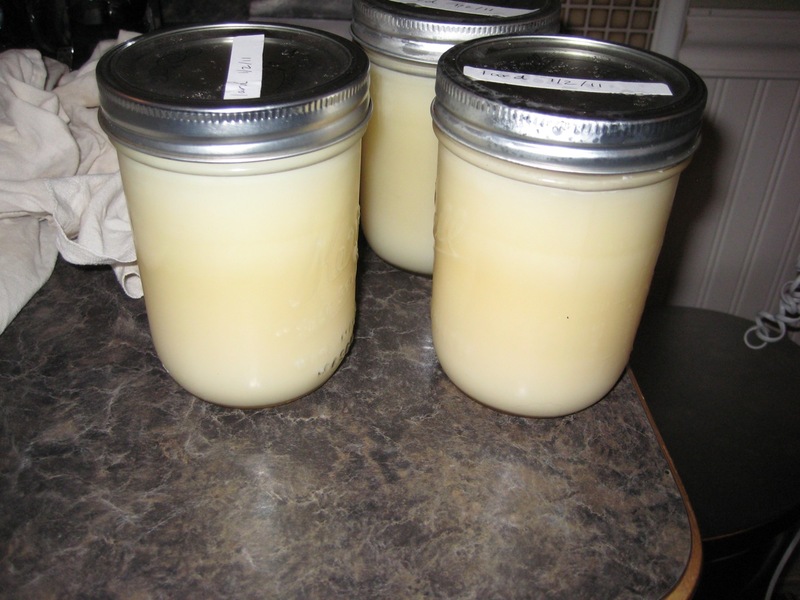 SO, if you live in the Minneapolis area and have a hankering to try a half-pint of lard, I have several extra. As well as a TON of frozen cracklings. I’m sure you’ll all be knocking down my door, right? Categories: Animal ethics, Cooking and baking, Practical, Theoretical | Tags: lard, Nourishing Traditions | Permalink. We switched to butter from grass-based cows. Sometimes I make it myself, sometimes I buy PastureLand butter. Either way, it’s both expensive and tasty. And packed with vitamins of course. We bought our meat mostly in the form of meat bundles from the co-op. You get nicer cuts of meat, like steaks, roasts, etc., for a lower per-pound price. When we buy meat off the shelf we tend to just get the cheapest cut we can find. Nobody needs that many drummies. Started buying more non-food items, like soap and toothpaste, at the co-op. This is partly to avoid going to Target, and also partly to try and support local merchants. So, I should really run our Target numbers because we probably reduced our monthly Target bill by at least $25. There. I feel better already. SO instead of being unrealistic about 2011, how about this: I will just try to hold the line and not increase again this year. 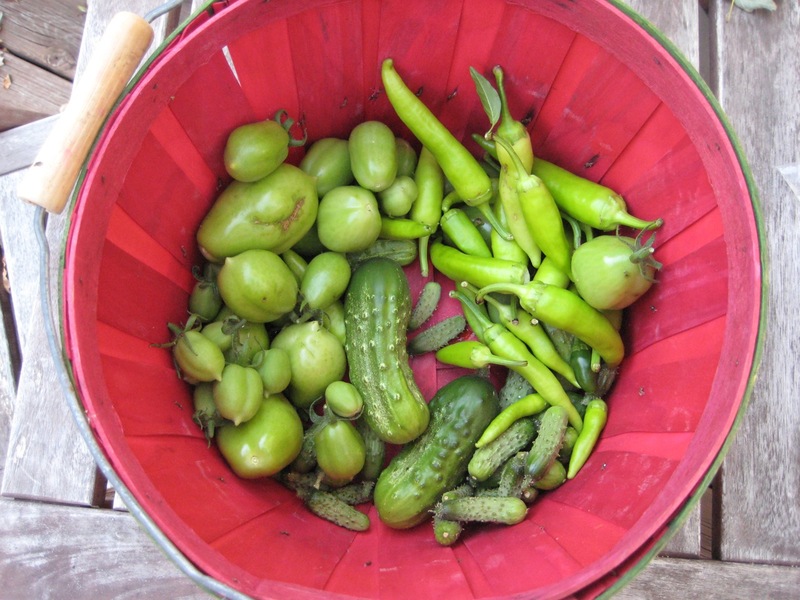 The only major difference coming up this year is that we are discontinuing our CSA. I was disappointed in the amount of produce we received in our weekly box. I also have plans for some major garden expansion this year, so we might be able to grow enough of our own to have plenty to eat and still put some by for next winter. 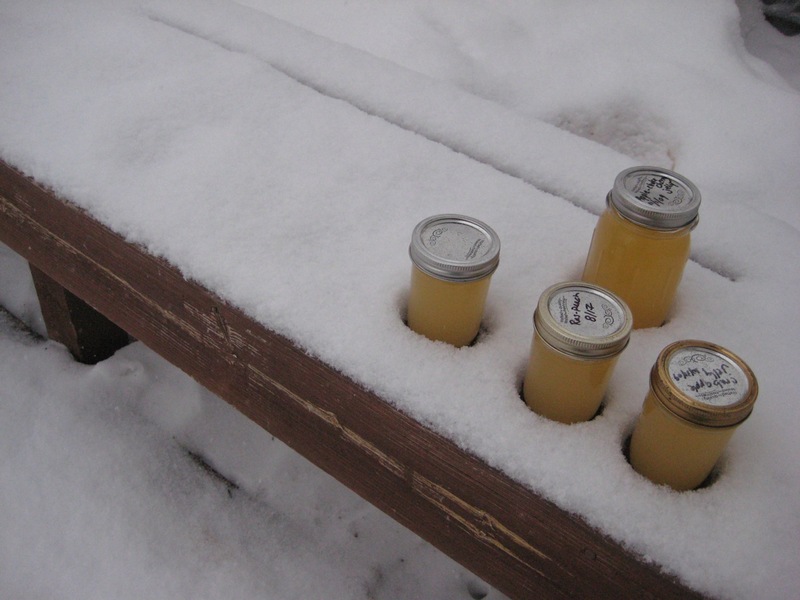 Categories: Nutrition, Practical, US Food Production | Tags: CSA, gettin' groceries | Permalink.